Win a new Nissan Micra at our Golf Classic! Further to our recent launch of the Maurice Ledwidge Memorial Golf Classic, being held this day fortnight, August 31, in Woodbrook Golf Club, we’re delighted to announce a great prize of a new car for a hole in one on the day. 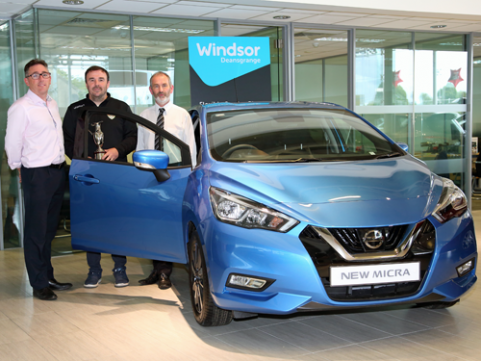 Many thanks to one of our business partners, Windsor Deansgrange, which has given every player appearing on the day an opportunity to win a brand new Nissan Micra should they achieve a hole-in-one on the day at the nominated hole. This only further enhances the event and will add some great excitement for all players. In order to be in the chance of winning the car, players must speculate a little and donate €10.00 for a shot at getting the car. All funds raised go to our community-based, volunteer-led club that caters for 60 teams in a ‘Football-for-All’ ethos. We wish all players on the day the best of luck and, hopefully, someone on the day will take home this fantastic prize. Many thanks to Pat Comerford and Roger Dunne from Windsor Deansgrange for facilitating this great opportunity. And, of course, don’t forget the post-play prize-giving and craic planned for The ‘Noggin Inn from 7.30pm on the day. Pictured at the sponsorship announcement were (l to r): Pat Comerford of Windsor Deansgrange, Oisín Ledwidge, also a former club chairman, holding the memorial trophy named in memory of his father, and Roger Dunne, also of Windsor Deansgrange. Enquiries about hole sponsorship should be made to Des Roche (087 285 0580) or Oisín (086 886 7574) without delay. Yet another attraction for what is building up to a great day out!